We have analyzed multiple tumor samples with Mutect2 (v4.0.6.0), especially FFPE samples. So far, we did not filter out any FFPE artifacts with FilterByOrientationBias on these samples. We recently analyzed a sample in which we have a lot of background noise in the mutational signature we get. We strongly suspect that this is caused by FFPE artifacts. Unfortunately, no FFPE artifacts have been filtered out in this sample. On the other hand, about 1000 OxoG artifacts have been filtered out. FilterByOrientationBias uses the number of reads that support the reference and variant in F1R2 and F2R1. This goes well if you isolate DNA and place it on the sequencing machine. What we do is isolate DNA and first amplify it, in order to have sufficient DNA. The DNA is then placed on the sequencing machine (Illumina). Because we have an amplification step before it enters the sequencer, we no longer have an orientation bias, but the variants (FFPE artifacts) are on both strands. Does this explain why we do not filter out FFPE artifacts? We checked what happens when we do not filter on C/T artifacts (FFPE), but on G/A artifacts (the opposite). Now, 4000 variants are filtered out. The mutational signature we now get highly correlates with the signature we expect to get. How is it possible that FilterByOrientationBias filters out G/A artifacts, which we suspect as FFPE artifacts? 1.) FilterByOrientationBias is a deprecated tool. 3.) The output of LearnReadOrientationModel is what is passed into Mutect2. 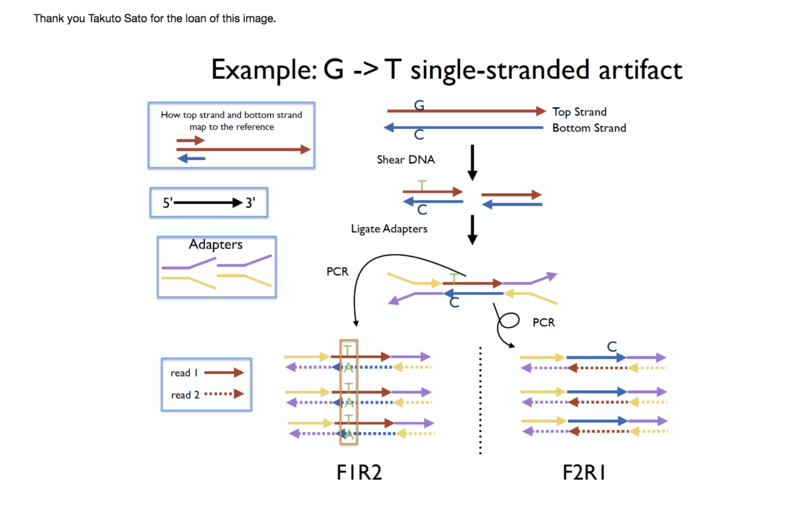 The concern about amplifying before sequencing is not an issue because what starts as strand bias before amplification appears on both strands after amplification, but it still retains an orientation bias. That's the power of this signature -- it essentially lets you go back in time and catch any substitution that started out on a single strand. @Erik84 Thank you for the feedback. @Erik84 I have asked for some input from development on this error. Ah yes, that is correct. I believe that one is in the works. Thank you for pointing out that there are new tools to filter the artifacts. We performed a test with Mutect2 4.1.0.0 (tumor-only mode) on 2 samples, including these new tools. So far we are very satisfied with the results we get! Compared to Mutect2 4.0.6.0, the FFPE artifacts are much better filtered out. Yet, I still don't quite understand why it still retains an orientation bias. Is there a document where this aspect is explained in more detail? @AdelaideR , hi, thanks a lot. is gatk4.1.1.0 a version for production, because CollectF1R2Counts is no longer a separate command. Thanks for the nice picture. I will look into it.